MONDAY, July 18, 2016 (HealthDay News) -- As officials at all levels of American football continue to debate how to prevent concussions, a new study using data from devices inside the helmets of high school players confirms that hits with other players are especially damaging. "Impacts to the head that resulted from contact with another player were of higher magnitude than contact with other surfaces, such as the ground," said study author Julianne Schmidt, an assistant professor of kinesiology at the University of Georgia. "We also found that running a long distance before colliding with an opponent resulted in higher-magnitude head impacts compared to running a short distance," she said. The researchers suggest that officials consider ways to reduce collisions between players that put the head in danger, especially those involving players who have run longer distances. "We know that even young kids in elementary school who play football sustain impacts of significant force and do have concussions," said Dr. John Kuluz, director of Traumatic Brain Injury and Neuro-Rehab at Nicklaus Children's Hospital in Miami. "But we do not know the long-term consequences of hits to the head in children." 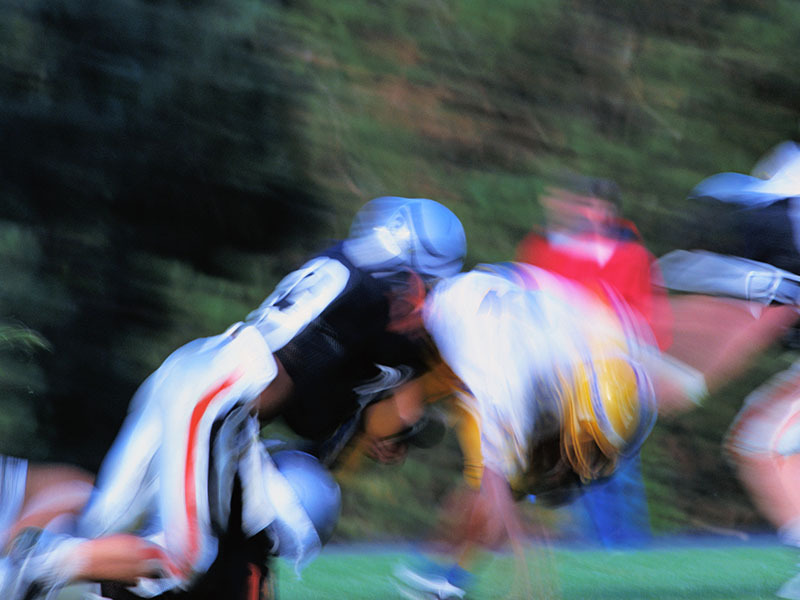 Concussions can cause headache, dizziness, loss of consciousness and other symptoms. The wide majority of concussion sufferers appear to recover within a couple weeks, but some continue to have symptoms. Research has linked concussions in adults to Parkinson's disease decades later. And thousands of retired National Football League players successfully sued the league, charging that it didn't do enough to protect them from the long-term neurological effects of hits to the head. Such effects include a progressive brain disease known as chronic traumatic encephalopathy (CTE), mood disorders and memory problems. In the new study, researchers outfitted 32 high school football players with devices that monitored the movement of their heads upon impact. The researchers analyzed video and other information from almost 4,000 impacts during a 13-game season. The researchers found that several kinds of hits resulted in a larger magnitude of impact: those with other players; during the second quarter; in the first of a two-part impact, and when players traveled a longer distance prior to the collision. The researchers also linked three-point stances (when players line up with one hand touching the ground) to higher-magnitude impacts when they were combined with players traveling a longer distance. And they found a higher risk in impacts linked to two-point stances (with no hand contact with the ground). Why do starting positions at the line of scrimmage matter? "Starting with your trunk down in a position similar to a track start gives you more momentum going into a collision," Schmidt explained. "When you allow that momentum to build over a long running distance, it seems to result in higher-magnitude head impacts." So, should two-point or three-point stances be banned? "High school football players that start in a three-point stance do not typically run a long distance before collision, but some position types like tight ends and defensive ends might be more likely to combine the two," Schmidt said. "Eliminating the three-point stance all together might not be the answer either," she added. "The three-point stance alone doesn't result in higher-magnitude head impacts. In fact, we found that overall head impacts that resulted following a three-point stance were less severe than a two-point stance." Brain injury specialist Kuluz said the study appears valid. So what should be done? "Schools should emphasize proper tackling technique by teaching proper head and body position," Schmidt said. "Keeping the head up and avoiding head contact with another player may reduce the magnitude of head impacts sustained while playing football or prevent the head impact all together." Schmidt also suggested using rules or coaches to reduce collisions that occur after players run a long distance. The study was published online July 18 in the journal Pediatrics.